HSBN and the Miami Marlins have entered into a groundbreaking, expansive partnership, which, among other things, will see the Marlins become the name sponsor and have a major presence at HSBN Media Day Weekends. Additionally, HSBN and the Marlins are proud to announce that the 2019 HSBN Broward-Miami Public and Private Senior All-Star Games and Awards Event will be hosted at Marlins Park. When the new Miami Marlins ownership group came in and started making immediate changes to the roster two years ago, the organizations plan was to build a team that could sustain success on a consistent basis. In order to create a new legacy much of the work has to be done behind the scenes, but the goal is for the Miami Marlins fan base to commit to their home team, as much as the Marlins are committing to their community. Through the years, HSBN has partnered with the Marlins on various projects, but this year, those meetings felt different when the Marlins reached out in early summer. The result is today’s announcement of the 2019 HSBN / Miami Marlins partnership. It is a partnership that is expected to benefit the high school baseball community down here in South Florida greatly. From those meetings came an enhanced partnership that will include the Miami Marlins becoming the name sponsor of HSBN Media Day Weekends. In addition to being the name sponsor, the Marlins will have a strong physical presence at the weekends, taking up the coveted speaking spot during the introduction video. The Marlins have several surprises in store for their intro video; without giving up too much, they plan on outlining their vision, while having several significant members of the organization address the high school players, coaches, and parents in attendance at Media Day. The Marlins will also be offering game vouchers to all players and coaches that attend Media Day. It is just the start of what the Marlins believe will be a grassroots effort to re-engage with fans. 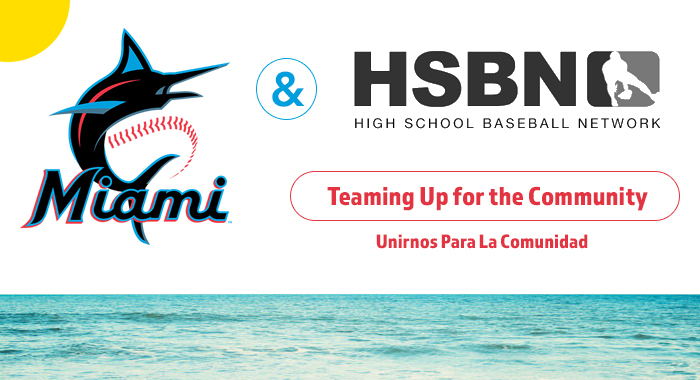 “We found a great partner in HSBN to team up with as we continue to grow the game of baseball in South Florida as we enhance our involvement in the youth community,” said Marlins President of Business Operations Chip Bowers. HSBN and the Marlins encourage all parents and fans to attend Media Day Weekends, to gain further knowledge into both the upcoming high school season, as well as the Marlins plan for the future. Here is a link to the Media Day event. The Media Day sponsorship was one way the Marlins wanted to engage the community, and the Marlins still wanted to do more with their partnership with HSBN that goes beyond just hosting Media Day. For years, one of HSBN’s premiere events has been the Broward vs. Miami Public and Private All-Star Game and Awards Event. Sending off seniors in their last game in grand fashion, as well as recognizing HSBN All-American players, has always been a priority for HSBN, and the Marlins joined in. 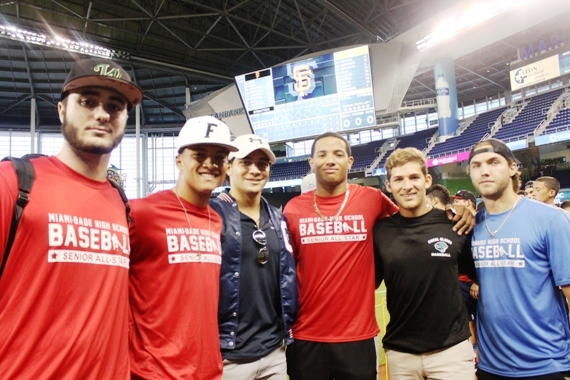 Both the public and private school all-star games are set for Tuesday, June 4th at Marlins Park. The private schools game will be at 4PM, and the public schools game at 7:30PM. The seniors will get the chance to end their playing careers by having a pregame meal, taking BP, Infield/Outfield, and playing the final game of their high school careers at Marlins Park. When the Marlins shifted their community focus to making an impact on youth baseball, they knew HSBN was a logical fit based off their tremendous work that was being done here in South Florida. Outside of the Media Day and All-Star events, the Marlins and HSBN will be working together on many other projects throughout the year. 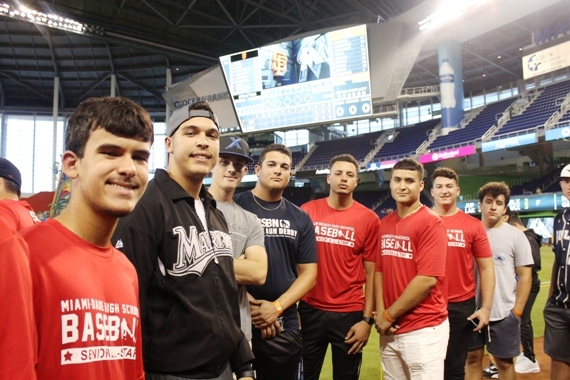 HSBN has worked with the Marlins on their Field of Dreams program for several years, and again assisted in finding high school programs to play at Marlins Park as part of the program for the upcoming season. The two organizations continue to brainstorm and will be unveiling further programs moving forward, something that both the Marlins and Uttariello believe is vital to the team and the community. As for the Marlins, the HSBN partnership is just the beginning, and we are both excited for what the future holds.